Used to be a busting border town in Dong Van plateau (Ha Giang province), but now Pho Bang is sunk into oblivion. It has seemingly overslept for a few decades. 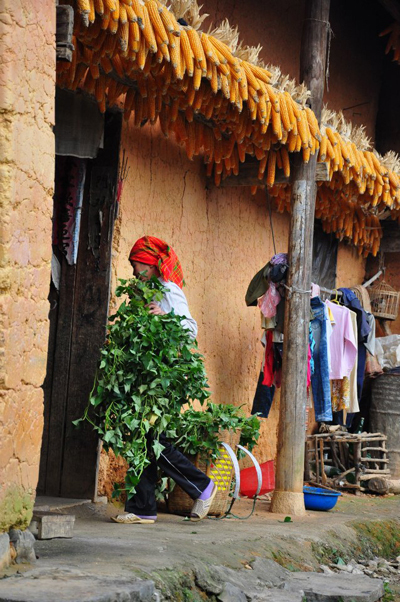 In a journey to Ha Giang that travelers desire to find authentic tastes, they won’t miss Pho Bang. 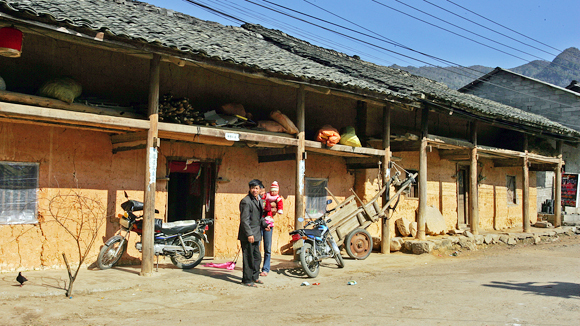 Dong Van district has two ancient towns of Dong Van and Pho Bang, in which Pho Bang’s population is about 500 Chinese people alternate with Hmong ethnics. 17 km from Yen Minh town, way to the town features tortuous slopes with radiant grounds of buckwheat flowers and wild marigold along 4C highway and on foot of sharp, soaring mountains. There is a T-junction with ahead way to Sung La and the left turn to Pho Bang. Commonly, travelers will move straightly from Quan Ba – Yen Minh to Sung La – Lung Cu – Dong Van town and skip Pho Bang 5km away from the T-intersection. Owning to being sequestered and inconvenient to reach, so hard to see strange guests in this town except several curious Vietnamese backpackers. That’s why it’s dubbed as an overslept town. The T-junction to Pho Bang is a cloudy road dipping into dense fog in winter. On the foot of towering, pointed hills, adjoining soil houses like in fairyland stand silently and peacefully in Sung La valley. 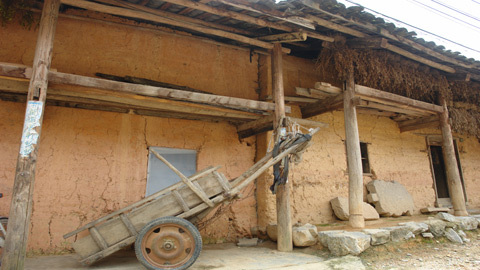 If departing from Dong Van old quarters to go up to Pho Bang, travelers will take a nearly 20km craggy route of passes, protruding with one side is deep chasms and the other side is high mountains covered with leaden, rugged rocks. Corn farms are green in a startled way due to occupation of rock and rarity of soil. This border town, geographically not distant, especially road to here is not difficult, but image of a hectic place, a stinging, hot-spot several decades ago, when opium and drug occupied Pho Bang as a hub, was gone far away; just a peaceful town left. Formerly, Pho Bang was an administrative – economic – social center of Dong Van district. However, after the district was moved deeply interior barely 20km, Pho Bang has become an overslept woman among mountains and forests. Also a frontier ward but Pho Bang is located deeply inside inland than Lung Cu flag pole and Dong Van town. However, it’s at a higher altitudes, so the climate is colder with a freezing winter as snowy as in Sapa and Mau Son. Cross Sung La – the sole “rain navel” of the water-lacked, grey-rocked Dong Van district - then overcome another out-of-the-way jungle stage, Pho Bang suddenly appears halfway. It is the scarce valley in this area, because if you stop on roadside, look before and behind, turn left then right, you just only find vast, superb mountains at all four sides. If someone misses a roll of hand grip, they can get right to hedges bordered between Vietnam and the neighbor country China. Lost in Pho Bang, it brings feeling like in a big film studio with setting of olden days. 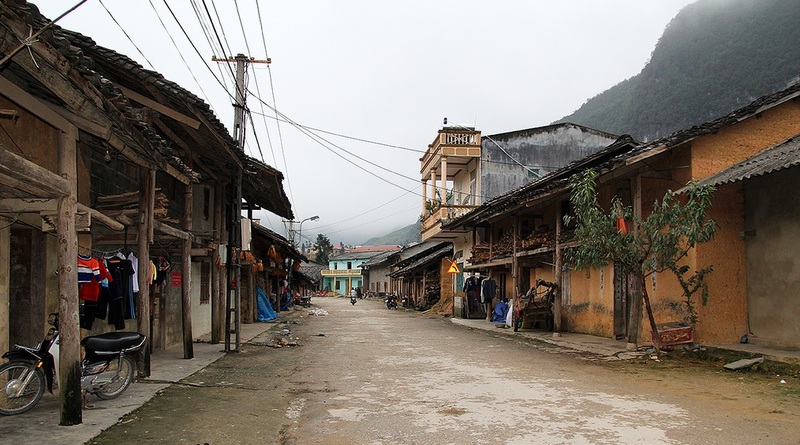 The town includes traditional houses with moss ying-yang roofs and damp, dark yellow soil walls. Pho Bang only remains sparely two quite deserted streets with about one hundred ancient roof-tops, aged above 100. It’s inhabited mainly by Chinese people alternative to Hmong tribe, but this is not enough to change sad and still appearance of this mountain town. Colors of time cover all corners. In front of each houses, there is a couple of Chinese parallel sentences having changed colors. A few grocery stores are opened to sell essential things behind square windows while some aged, wooden shut-doors are always dormant. Life in the town passes slowly and monotonously, a calm, simple life among a solitary highland. Some women sit in front to pick up vegetables, chop wood, sew or embroider. Some elders on chair fondle back of lazy cats. Some garrulous children plays marble shooting game. 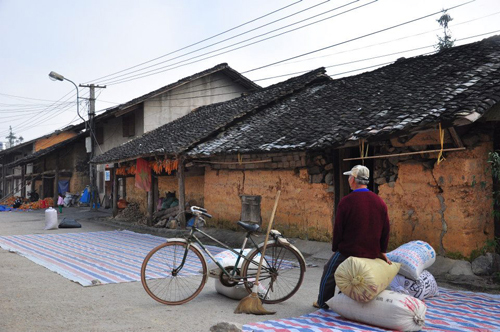 Street sides becomes yards to dry corns and soybeans, which are hang fully on every rooftop. Cloud drifts through streets. When twilight falls, the weather is colder, the streets quickly sinks into ethereal fog. All the town just wakes up suddenly on backward rotating markets, which is hold every 6-day from morning to noon. Pho Bang is dubbed as the "valley of roses" thanks to brilliant, picturesque rose fields spreading along slopes around the ward. 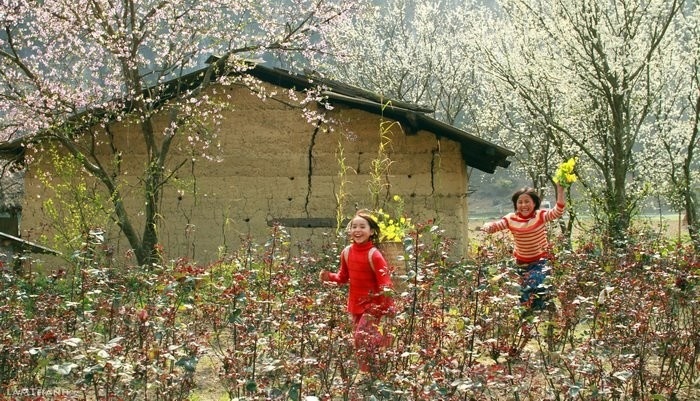 It features many stunning sights of peach, plum, pear blossoms and also buckwheat flowers like many other areas in Ha Giang. Way to Pho Bang border gate is really scenic by untouched rock mountains.